Another day, another new stamp set from Joy Clair Stamps. This stamp set has images for Valentines, Wedding, love or you could also use it for Bible journaling. 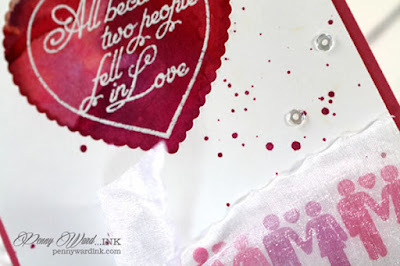 Really wanting the sentiment from the Song of Solomon stamp set to be the focus of the card came easy when I watercolored a small panel with my new Peerless watercolors (that I won...woohoo) then heat embossed the gorgeous Love saying. Front panel was die cut with my Silhouette Cameo, stamped the cute stick people and splattered paint across the front. Wrap with sheer ribbon and add a few sequins. Click on over to the Joy Clair shop HERE to check out all seven new stamp sets. Do you love when a die cut matches the stamp? Do you have a Silhouette or Cricut machine? 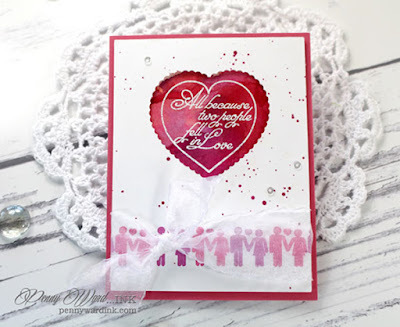 At Joy Clair the SVG cuts to match all of the stamp sets are just 1 cent. Happy shopping and die cutting! Beautiful card. Love the sentiment and all the stick people.